IR439 GPS SENSOR TO PULSE OUTSIDE ANTENNA MEMORY now updates 10 times in one second! Works on GPS 'USA' + GLONASS Russian 'GPS'+ BEIDOU CHINESE 'GPS' All together triples the satellites ! GPS speed sender to be used on most types of electronic tripmeters such as Terratrip, Brantz, Belmog classic etc. 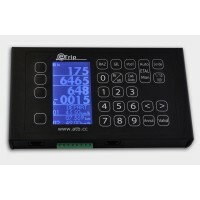 This little box makes it possible to use an electronic tripmeter without the need to install a cable or wheel probe and to change it to another car without the need to re-calibrate. Not to be confused with a ‘normal’ GPS receiver, this instrument is very accurate tracking 58 satellites simultaneously! And can send over 8.000 pulses to a Terratrip in one minute! PASSING TROUGH A TUNNEL…NO SIGNAL??? NO PROBLEM THE INTERNAL MEMORY ADJUSTS THE TRIPMETER WHEN IT HAS AGAIN CONTACT WITH SATELLITES! This clever device translates the GPS signal reception to 9.1 V pluses. 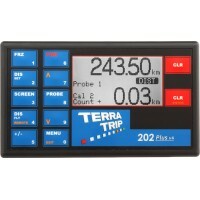 It can be used as a sensor for most electronic Tripmeters such as Terratrip, Brantz, Belmog classic etc. The receiver/sender is 6,5cm x 5cm x 2cm. The antenna is 3,5cm x 4cm x 1cm. This little box comes with a magnetic antenna that can be used inside or outside the car. Normally only three of the four wires need to be connected to be used on a tripmeter. Pulse rate: variable (1000ppk to 10 000ppk) or fixed 2000, 4000, 8000, 50,000. 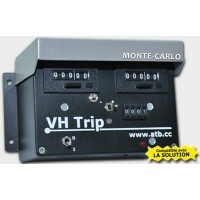 Standard programmed to 8000 (the max for digital tripmeters), when leaving the Belmopshop. 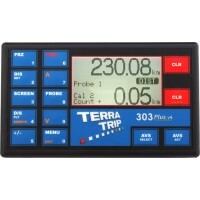 We can ajust to lower values for electronic tripmeters with mechanical counters.